Cafe Cross-Legged @ Petaling Jaya @ Malaysia - Always Travelicious ! Cafe Cross-Legged in Kota Damansara, PJ, is a fusion cafe, serving original recipes with a twist and with a thought for the health conscious. Starting with my favorite dish, the smoke chicken rice is not your usual gingery, soy sauce Hainanese chicken rice, but it is succulent chicken breast smoked to tender with a uniqe woody taste topped with a dash of black pepper. The rice is a bit of a surprise as it is fluffy and fragrant with mixed herbs. 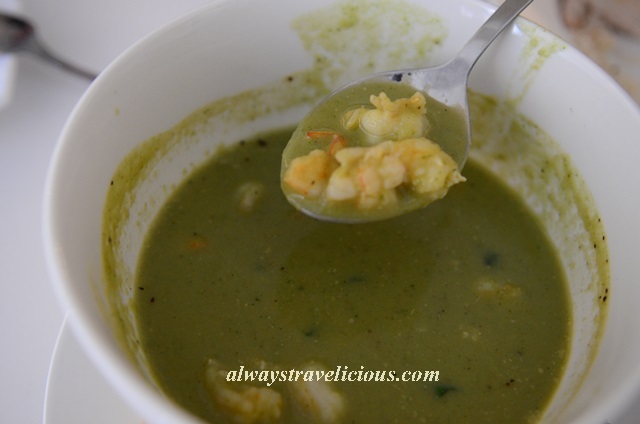 The broccoli & prawn soup is decadent I just kept digging for more. With so many prawns hidden beneath, the prawn-y flavor is intense it is as if we were having prawn bisque. Two distinct flavors of broccoli & prawn that gave a perfect amalgamation. The lemongrass chicken pasta is another scrumptious dish with chunky chicken and vegetable bits. A lightly spiced, tom-yam flavored pasta with a refreshing taste of lemon grass. Love the creamy chicken chop with potatoes. Again, staying true to the notion of healthiness, the chicken chop is pan-fried as opposed to deep-fried chicken chop. The salad is actually not on the menu but made to meet our special request as we loved the salad sauce from the salmon puff so much. The salad sauce is sesame based and lightly tangy. Haven’t really tried any salad sauce like this so I think it must be a novelty. The salmon puff is baked till golden and flaky on the outside with generous salmon bits within the puff. All three of us, Gary, KS and I ate too much food and all we could manage to squeeze in for dessert was the panna cotta, one little panna cotta shared between the three of us! Classic Italian dessert smooth, silken and not too heavy on the cream. The cafe has a nice sofa set as a center piece and also a place for you to sit cross-legged comfortably. The interior decor is simple with a few cozy corners to sit around. Look out for Cross-Legged that’s on the first floor. While Cross-Legged Cafe’s menu doesn’t serve a whole lot of selection,”Everything is a signature dish” was the answer that I got when I curiously enquired about their signature dish. Overall the food is pretty awesome at the cafe. Taste is kept original without an overwhelming of seasoning, the best part is, no MSG. Food is prepared via smoking, baking, pan-frying which results in a non-oily and a calorie-friendly meal. As the restaurant is still new, there is still room for improvement. Thought the salmon puff was not light enough, and the smoked chicken rice can be perfected by using the salad with sesame sauce as a side to make it a truly fabulous inside out twist of a classic Hainanese chicken rice. Look forward to another a calorie-friendly meal there again! Address: 1st Floor, 67-1, Jalan PJU 5/21, The Strand, Kota Damansara, Petaling Jaya, Malaysia. Opening Hours: Weekdays 10am – 4pm. Sat & Sun 10am – 6pm. Closed on Tues & Wed.